Easy operation, low maintenance and excellent finish are some of the main attributes of our Plywood UV Lamination Machine. The machine that we offer can print on all kinds of rigid surfaces such as glass, aluminum composite panel and many more. Our machine comes with online and offline systems. We can provide customized technical specifications as per the requirement of buyers. 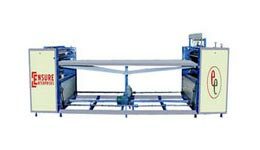 Our Plywood UV Lamination Machine is available at reasonable price. Sizes Available : 12", 24", 30", 36", 40"